Shortly after I started editing the video “Virtuoso” I began to dream up a soundtrack. About the only specific request Lost Art Press gave me was that they wanted the music to be piano based. H.O. 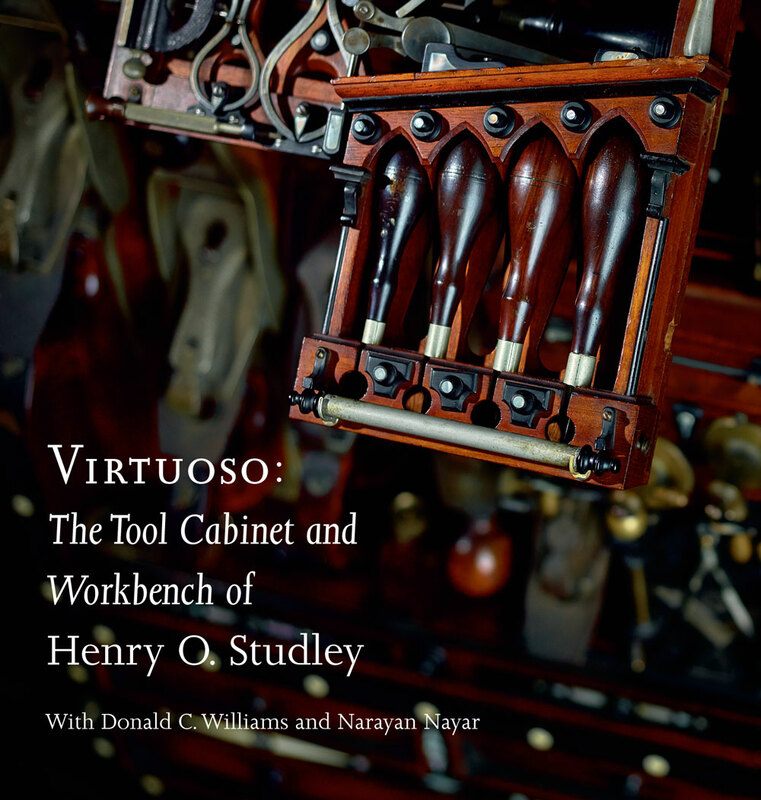 Studley spent his working life as a piano and organ maker so it was only fitting that the music pay homage to his work. Considering Studley made pianos in the early 20th century it seemed obvious that I could put any ole Scott Joplin track in and it’d work. The only problem was that it didn’t work. Narayan and Chris went to great lengths to capture the footage as perfectly as possible. The lighting is fantastic and for the most part all of the shots are crystal clear. Putting a musical bed that was recorded in 1910 against footage that was captured in 2013 would create a disconnect between the two. Even though the subject was from the early 1900s the video and photographs of the tool chest were clearly modern. I needed to find a way of paying homage to the time period Studley worked in while making sure the music seemed timeless to today’s viewers. My greatest hurdle was the fact that I didn’t think like a piano player. I can play piano fairly OK. I can make it sound like I play piano pretty well if I’m given the power of modern day recording software. But creating a piano soundtrack proved to be quite difficult for me. For me, piano is a second language and creatively writing in a second language can be quite difficult (I’d assume: I don’t creatively write and I don’t speak a second language). A great friend of mine bought me a baritone ukulele years ago and it quickly became my favorite instrument to play. It’s small enough to play reclined on the couch watching a football game. Quiet and subdued enough to not bother my wife and best of all for some reason the limitation of four strings makes the guitar player in me think more creatively than when I have six strings. For this project the baritone ukulele became my sketchbook. As I was editing video I always had my uke within arms reach. Video editing can get pretty tedious and while focusing intently on something technical I found that my mind could creatively wander. Often times a melody would pop into my head. I’d quickly grab the uke and record the newfound musical idea into my phone. Once I was no longer asking my brain to be creative while trying to play piano I was able to just concentrate on playing piano. After I was done with the editing of each chapter I’d play it over and over while experimenting with a piano track based on what I came up with on the ukulele. Once I had the basics figured out I would record the soundtrack a few times while watching the video, making sure to line up any spots without dialogue and especially making sure to get out of the way when nothing was necessary. 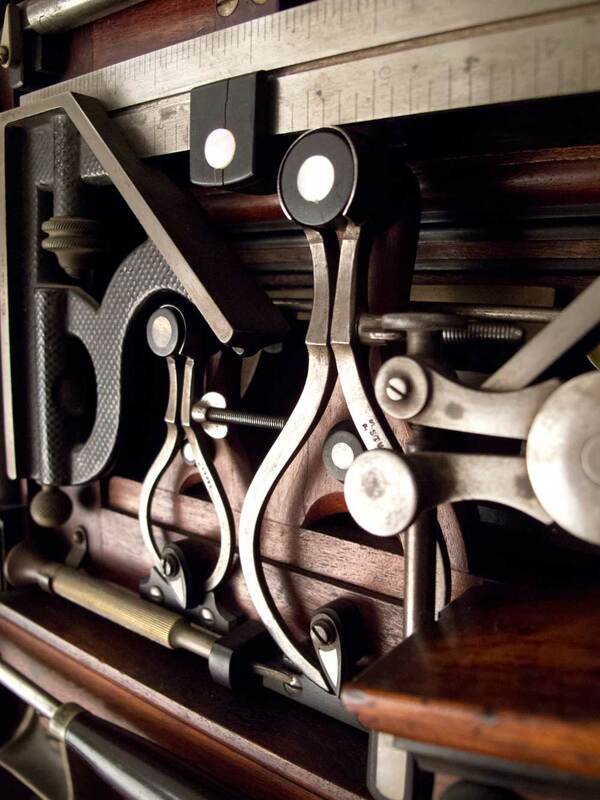 Most of what you’ll hear is a simple upright piano. Sadly, because of the hours I was working on the film (night time often when my son was in bed) I wasn’t able to use a real life acoustic piano. I wound up using the Braunschweig Upright samples from Imperfect Samples. An upright piano seemed the most appropriate to me because every picture I’ve seen of a Poole piano (where Studley worked) was an upright. I like the Braunschweig samples because they sound like a well loved and well maintained piano from the early 20th century that is starting to show its age. In the chapter “Enigmatic Genius” you’ll not only hear the piano but you’ll also hear a reed organ, which would be somewhat similar to what Studley might have worked on when he was employed by the Smith American company. This particular organ is an Estey portable preacher’s organ circa 1906. The organ belongs to a friend of mine and I was lucky enough to sample it myself a few years ago (it can be heard on almost every record I’ve worked on). The film ends with more than 20 minutes of footage of the tool cabinet being unloaded piece by piece. I knew that the music here was going to be of much greater importance because there is no dialogue at all. I also knew that I was nowhere near the composer and nowhere near the piano player to come up with something that could stand on its own the way this section needed. Here in Nashville we are incredibly lucky to have some of the best musicians in the world just a phone call away. I first met Micah Hulscher when he came to play on an Americana record I was producing for David Newbould. I hired half the band and David hired the other half. I had never worked with Micah and didn’t know what to expect other than a few people telling me he’s a monster. He came in and immediately started playing (what I assume was) a Bach piece. Normally this wouldn’t be a red flag, but when you’re working on a record where less is more I instantly went into worry mode. Moments later as Micah was playing he seemingly moved into a Jelly Roll Morton tune in three moves. I suddenly realized he was a rare talent and proceeded to pick my jaw up from the floor. Throughout that recording Micah blew me away with his ability to play anything but more importantly his ability to know when he needed to play nothing at all. I called Micah and explained the task we had in front of us. A few weeks later in between dates playing with Emmylou Harris and Rodney Crowell, Micah came to my house and we got to work. Over the next few hours I would play him a section of the video and we’d discuss a style that would be fitting. Micah would compose something on the spot and we’d start recording, watching the video the whole time. When the day started, Micah seemed to think it was silly that a tool cabinet warranted a book and a video about it. By the end of the session he was commenting on how mesmerized he was watching the tools come out of the chest and wanted to know more about Studley. I think the viewers will find Micah’s playing and compositions perfect to help guide them through the unloading of the chest. The unloading is not for everyone. I’m sure many spouses will leave the room after a few minutes but I hope many viewers will be as enthralled by it as I was. The intention of the editing was to show as much of the unpacking as possible while leaving out any unnecessary parts. Hopefully Micah’s playing makes this portion a little more palatable for those who aren’t mesmerized by tools coming out of a cabinet. Cool. If you enjoy the baritone uke, you might want to try the Cuatro Venezolano. Same size and the same chord shapes but a bit more of a resonant “flamenco” sound. I live in a hispanic neighborhood and came across on in a little music shop one time. Very cool instrument. I think two baritone ukes will do if for me right now… yes I have two. Musical instruments. In Studley’s time, around 1900 there were the old nickleodeons which were an extension of the player piano with mandolins, cymbals, drums and other instruments in the cabinets played from a perforated roll of paper and often coin operated. About 35 years ago I worked for a fellow that restored these nickleodeons and I rebuilt the woodwork. 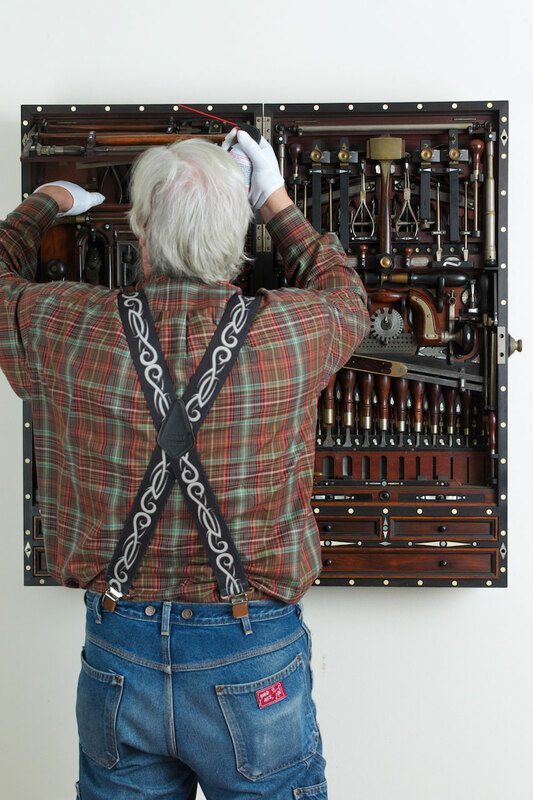 The instruments were cleverly layered into the cabinet just like the Studley toolchest. Some instruments were on racks which swung out just like his tools. As he worked in the piano industry I’ve always had the opinion that he got his ideas for a tool chest from nickleodeon designs. I have much higher appreciation and commitment to creative endeavors when I have a sense of the process. Thanks for sharing parts of your creative and technical journey, Ben. With a name like “Virtuoso”, only a a virtuoso pianist will do. As a woodworker and a shop rat with over 40 years of noise(s) plus a tin ear, I enjoyed the music almost as much as the video. The whole video was very well done. Speaking of the video, like the very first poster of the tool box, it is a must have. especially, if you didn’t get to Iowa to see it in person.